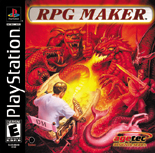 Hello, and welcome to the RPG Maker page! This page isn't an overview of the instruction booklets,no. This page will feature tips and tricks to help you to improve your masterpiece-in-the-works. What are characters exactly? Well, characters are, in a sense, YOU. They are you and your team in the RPG. They play out the world that you create in RPG Maker. They have stats, equipment, gain experiance and react with your environment. Events are things that hapen in your RPG. They can be the Innkeeper that you talk to, the people you meet in town, or the monster blocking your way ,for example. Object don't really do anything, unless you tie them to an event. Objects help build that atmosphere of the world that you're trying to build and are as important as anything else in your game.